What an unsatisfying week of Mets baseball this turned out to be. It’d be nice to get a few walkoff victories without first blowing leads, because the alternative is what we wound up with today. The continued ineffectiveness of both Gary Matthews Jr. and Frank Catalanotto has got to be pressuring the front office to do something by now, although Matthews looks like he’ll be hard to move if only because he plays center field and most potential replacements do not. Chris Carter ought to be in Catalanotto’s job by now but it wouldn’t surprise me to see the Mets give Daniel Murphy the first shot, and allow his imminent return to light the fire. Believe me, the bench is hardly the only thing wrong with this group. Jerry Manuel is still managing too passively and twisting himself in knots in pursuit of a “shutdown bullpen” that simply doesn’t exist, and the starting pitching still has issues, chief among them Oliver Perez. The Nationals visit this week and we’re not careful they could put us further behind them than we already are. Ack! Amazin’ Tuesday Update: Although we’re saddened by the unfortunate closing of Two Boots Tavern on the Lower East Side, we’re pleased to be back next week at Two Boots Grand Central. 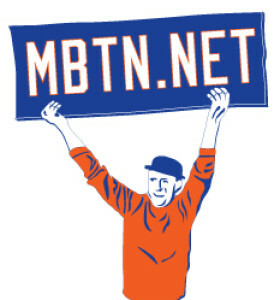 Join me, Greg Prince of Faith & Fear in Flushing; Taryn Cooper of My Summer Family and Josh Wilker, author the outstanding CARDBOARD GODS website and book, as we talk Mets, eat good pizza and watch the Mets-Braves game from Atlanta. As always your first beer is free in exchange for a Mets baseball card. Two Boots is located in the lower dining concourse at Grand Central Station. Hope to see you there! Help me help my sister fight Lou Gehrig’s Disease: Join me the in the Walk to Defeat ALS May 15 or sponsor my team. Thanks! Submitted by gored82 on Mon, 05/10/2010 – 8:13am. Submitted by Gordon Handler (not verified) on Mon, 05/10/2010 – 4:30pm. Submitted by Tom (not verified) on Mon, 05/10/2010 – 10:04pm. Chris Carter is up, Frankie C is DFA. Carter gets the #23 he wore in ST I suppose?